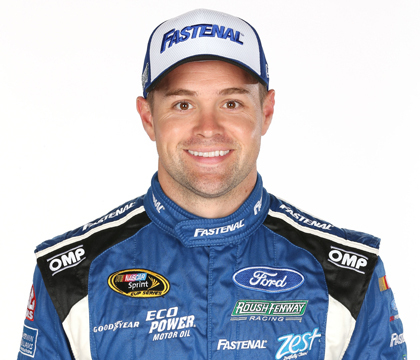 Ricky Stenhouse Jr, age 28, a double Xfinity Series champion in 2011-2012, is trying hard to find his rhythm in Sprint Cup Series. After two subsequent disappointing seasons in Sprint Cup (2014-2015) with declining stats (two top-five total), his seat in the 17 car must be in doubt. He needs the 2016 season to be a positive one with better results, which means more top-tens and a few more top-fives. Last season, Ricky’s average finish was 24.3 and that is not impressing at all. At Daytona, Ricky started in position 19 and ended up in P22. That’s acceptable result. 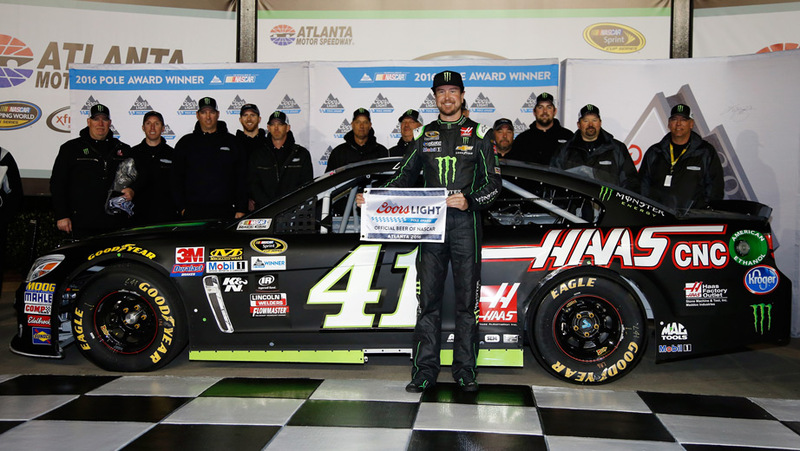 At Atlanta, Ricky got his first top 10 finish (P10) after starting from position five. 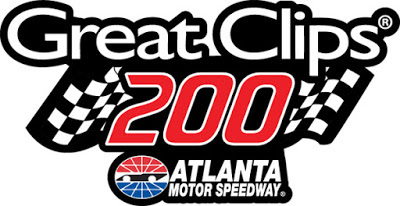 The no.17 car was hanging on pretty good at the Atlanta race and both Austin Dillon (P11) and Joey Logano (P12) were held behind him. Can this result give Ricky and the team a needed boost at Las Vegas? 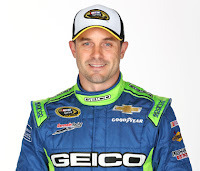 Casey Mears, age 38, is a full-time driver in Sprint Cup since 2003. Prior to 2003, Casey had one full-time season in the Xfinity Series (2002) which he ended up in 21st place. Casey has also a background as an open-wheel driver with full-time Indy Lights Series (1997-2000) campaigns and part-time IndyCar Series involvement in 2001 (1 win, 5 podiums in 12 races). His best year in Sprint Cup was in 2007 when Casey collected 1 Win, 5 top-five, 10 top-ten and 1 pole. Unfortunately, Casey lost his ride at Hendricks Motorsports in 2008. Since 2010, he has been driving for Germain Racing. The statistics for Casey in 2013-2015 seasons shows us a solid team with an average finish of 24.2 (2013), 22.3 (2014) and 23.1 (2015). Keep in mind that Germain Racing is a one-car team with lesser funds. At Atlanta, Casey has an average Sprint Cup career finish of 21.8. 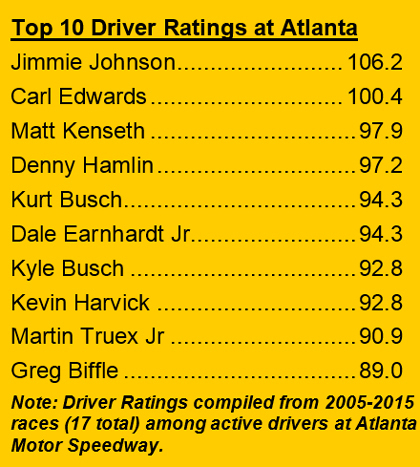 This season race at Atlanta ended up in position 14. 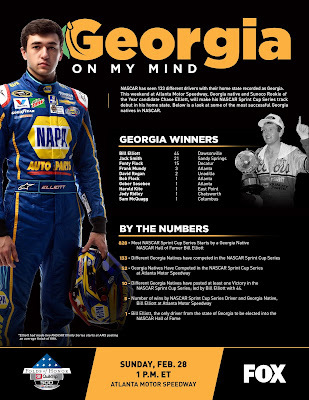 We have to go back to 2008 season for a better result (P12 – Hendrick Motorsports). Las Vegas is coming up next and that is perhaps not Casey’s favorite track according to the statistics (with German Racing) but perhaps it’s time to turn the statistics around? 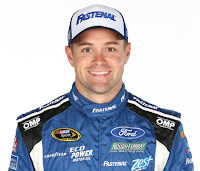 Chase got five “test” races in the 25 car last season with Kenny Francis as Crew Chief (Henrick Motorsports). This races resulted an average start of 24.2 and an average finish of 26.2 with one DNF. 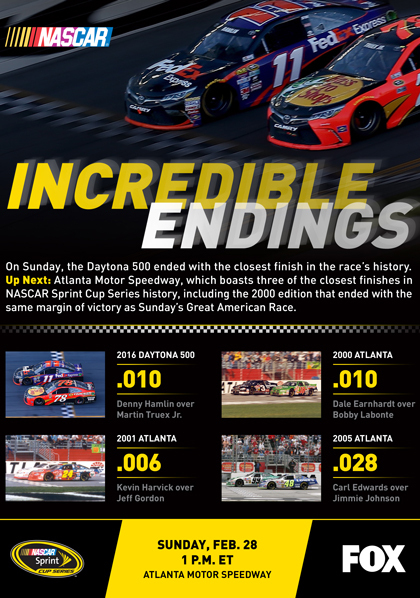 Valuable lessons were made under those five races. This season, Chase has Jeff Gordon’s crew chief of Alan Gustavson at the helm. Starting from pole at Daytona, Chase was involved in an accident and ended up in position 37. At Atlanta, the figures were reversed. Starting from position 24, Chase drove the 24 car all the way up to position 8. 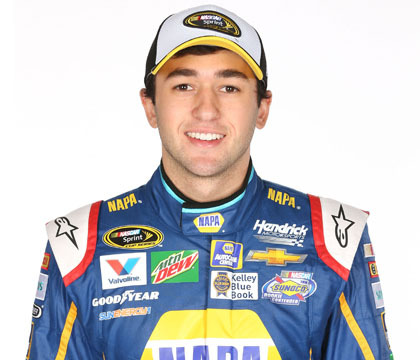 The future is looking bright for young Chase Elliott. 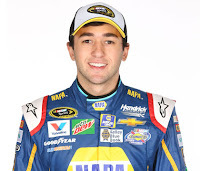 Chase Elliott has made two NASCAR Xfinity Series starts at AMS. His average finish is fifth place. 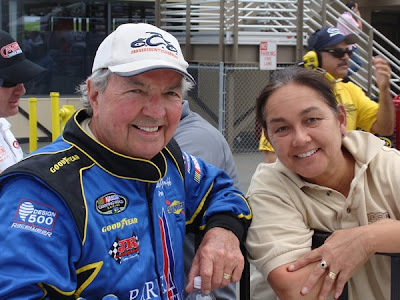 Elliott’s father Bill, lead Georgia winner with forty-four wins. Young Chase has some big racing shoes to fill!!! The hospital can be a scary place for anyone, but especially for children. To brighten up the day, The NASCAR Foundation brought smiles to the little patients in the Speediatrics® Unit at Halifax Health Medical Center by bringing a few friends along for a visit. The guest of honor for the event was Safety Sam, The NASCAR Foundation’s new mascot. The children enjoyed playing and taking pictures with Sam, and of course there were lots of high fives! The drivers listed above joined Safety Sam’s visit to the Speediatrics® Unit prior to the season opening of the Daytona 500. The children were excited to meet the real-life race car drivers and asked them all kinds of questions about the upcoming Daytona Speedweeks races. 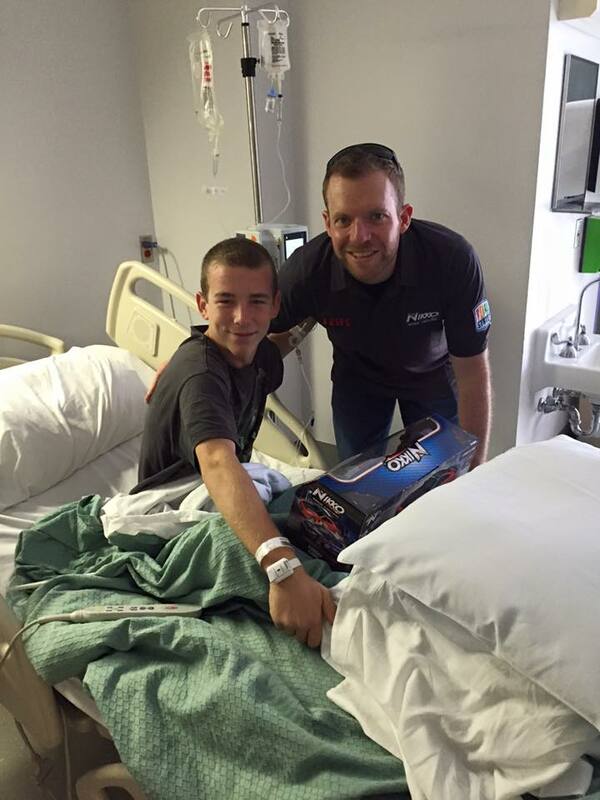 The NASCAR drivers delivered gift bags to the children and nurses in the unit while they also autographed hero cards for the patients. 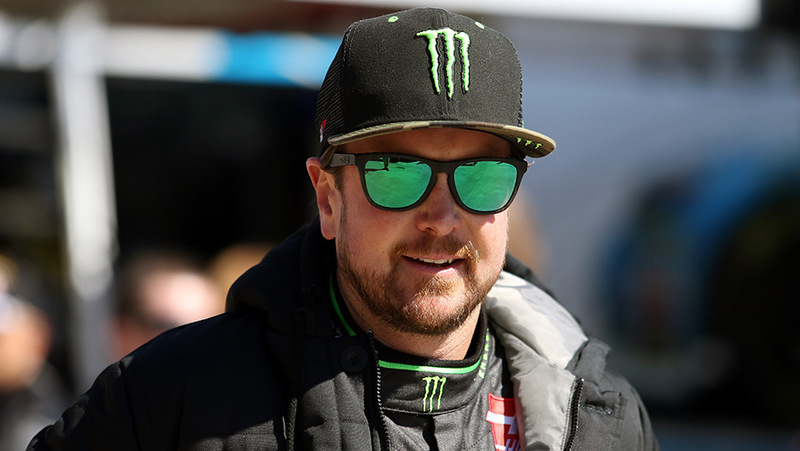 The reigning series champion, Kyle Busch's pole-winning car failed post-qualifying technical inspection Friday night at Atlanta Motor Speedway, putting his big brother Kurt Busch on the pole for Sunday's NASCAR Sprint Cup race. 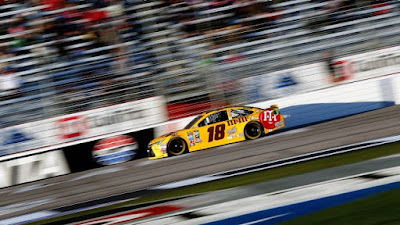 NASCAR Stated that the rear toe* was off on Kyle Busch car, however there will be no further penalties. "The parts move, everything moves, so you expect it to be a little bit different," Kyle Busch crew chief Adam Stevens stated. "This is the first opportunity we've had to gather post information, was right now, and it's game time and it was too much. ... Just the amount of load on the track moves everything a little bit, and that little bit was a little bit too much." 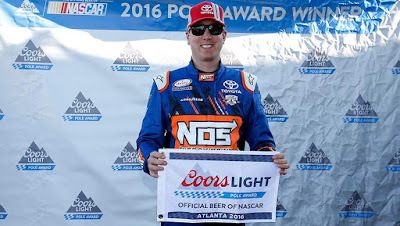 By virtue of "Rowdy's" disqualification, the elder Busch, Kurt, will slide over to the pole position with the next best speed of 191.582 mph. Kurt will be joined on the front row by Jamie McMurray, who scored a best speed of 190.130 mph. 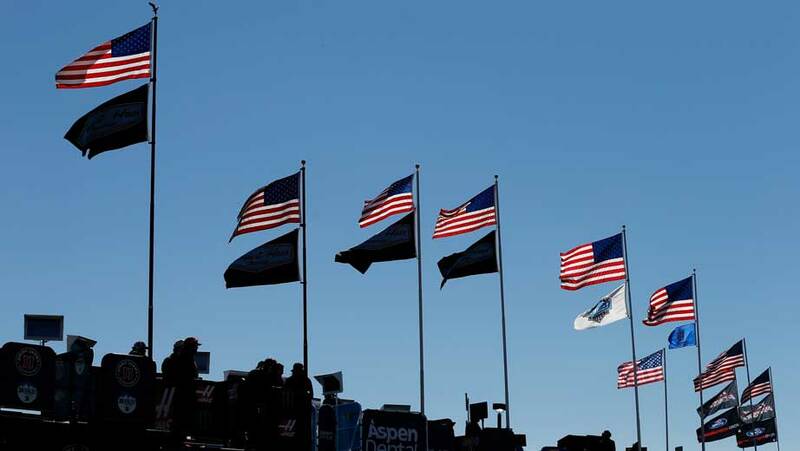 The field for the Folds of Honor QuikTrip 500 (FOX, 12:30 p.m. ET) will the the middle of a Busch Brother Sandwich as Kyle is relegated to the last place spot on the starting grid. * Toe is the way the wheel points (the front or rear of the wheel pointing inwardly or outwardly). These two factors are vitally important to the way a car handles because they determine how well a tire makes contact with the track! How “Hot” is your favorite driver at the quad-oval? 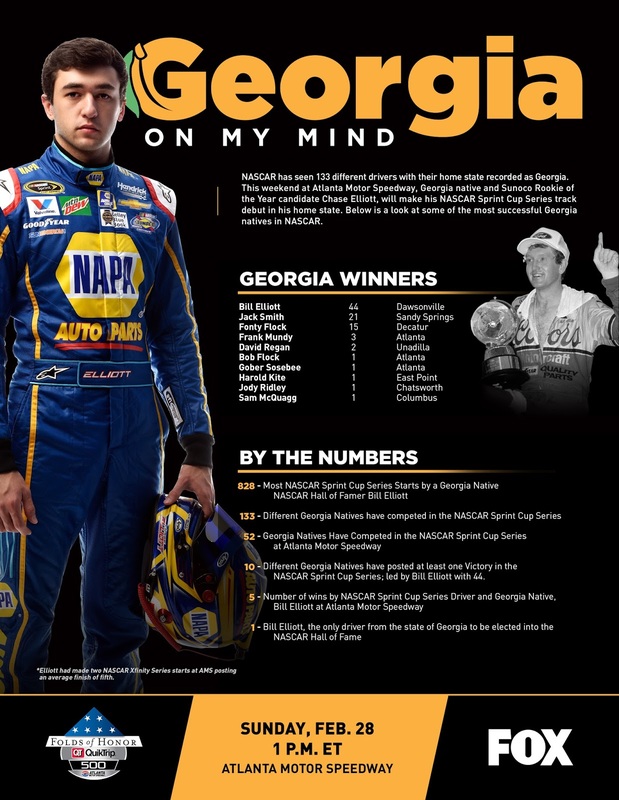 Below is a look at some of the top statistical performers at Atlanta Motor Speedway in Hampton, Georgia going into the Fold Of Honor QuikTrip 500 on February 28 (1 p.m. ET on FOX). and NASCAR Race Mom hanging out at Sonoma Raceway. Drivers who have competed in NASCAR for at least 10 years and been retired for two years are eligible for nomination to the NHOF. 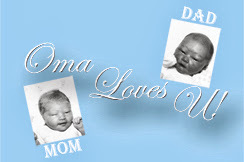 Previously, eligible drivers must have been retired for three years. 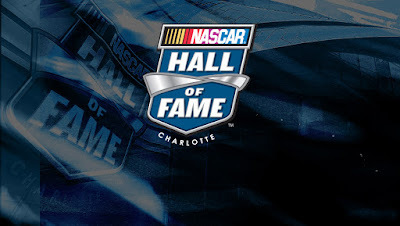 In addition, drivers who have competed for a minimum of 10 years and reached their 55th birthday on or before Dec. 31 of the year prior to the nominating year are immediately eligible for the NHOF. 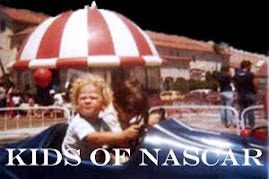 Any driver who has competed for 30 or more years in NASCAR competition by Dec. 31 of the year prior to the nominating year is automatically eligible, regardless of age. Drivers may continue to compete after reaching any of the aforementioned milestones without compromising eligibility for nomination or induction. 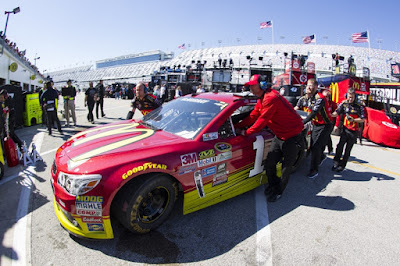 For non-drivers, individuals must have worked at least 10 years in the NASCAR industry. Individuals may also be considered who made significant achievements in the sport, but left the sport early due to a variety of circumstances. NASCAR Officials: Chairman / CEO Brian France; Vice Chairman Jim France; Vice Chairman of NASCAR Mike Helton; Chief Operating Officer Brent Dewar; Executive Vice President / Chief Racing Development Officer Steve O’Donnell; Executive Vice President / Chief Marketing Officer Steve Phelps; Senior Vice President, Competition Scott Miller; Senior Vice President, Marketing & Driver Services Jill Gregory. Track Owners/Operators: International Speedway Corporation CEO Lesa France Kennedy; Martinsville Speedway President Clay Campbell; Texas Motor Speedway President Eddie Gossage; Atlanta Motor Speedway President Ed Clark; former Indianapolis Motor Speedway President Tony George; Dover Motorsports CEO Denis McGlynn; Pocono Raceway board of directors member Looie McNally; Bowman Gray Stadium operator Dale Pinilis; Holland Motorsports Complex operator Ron Bennett; Rockford Speedway operator Jody Deery; West Coast representative Ken Clapp. Ford is joining forces with Stewart-Haas Racing starting in the 2017 NASCAR Sprint Cup Series season after the team signed a multiyear deal to switch manufacturers and engines (Roush Yates Engines). 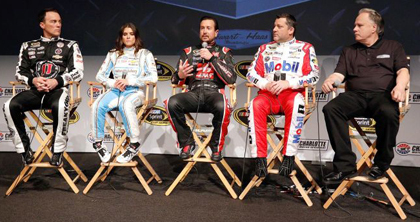 The team currently consists of Tony Stewart, a three-time champion, 2014 champion Kevin Harvick, 2004 champion Kurt Busch and Danica Patrick and drives Chevrolets. "I am proud of our association with Chevrolet as they helped build our organization into the team it is today," said SHR co-owner Stewart in a team statement. "This new partnership with Ford allows us to strengthen our position in the sport and ensure the long-term stability and success for everyone who is a part of Stewart-Haas Racing." "Stewart-Haas Racing has been a top-tier team in our sport for many years, and we wish them well in their future endeavor with Ford Performance. 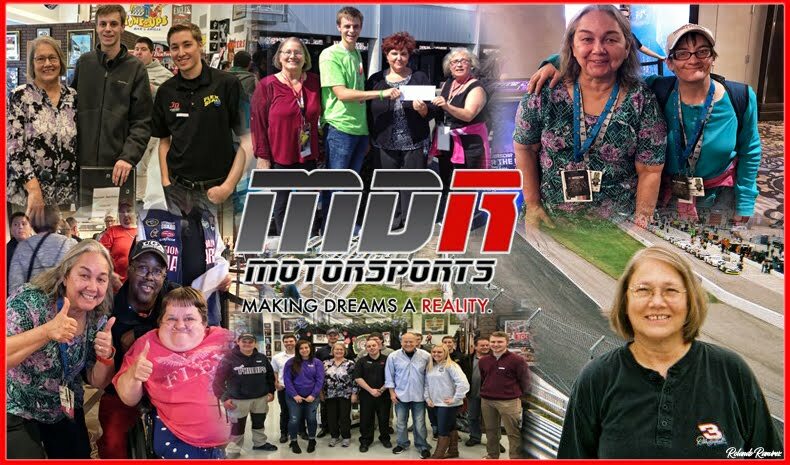 Our sport is rooted in healthy competition and NASCAR is fortunate to have three strong auto manufacturer partners all committed to the common goals of winning and growing the sport. We know that SHR and Chevrolet will work together as hard as ever this season to win races and pursue their third Sprint Cup Championship together." "We are thrilled to be able to add a championship-level team like Stewart-Haas Racing to our Ford NASCAR program," said Raj Nair, executive vice president and Chief Technical Officer, Ford Motor Company. "Tony Stewart and Gene Haas have the same passion for winning that we do, and bring a strong stable of drivers and personnel that fit into what we’re trying to do in the sport." SHR was founded in 2003 by Gene Haas as Haas CNC Racing. Stewart became a co-owner of the team in 2009. Stewart said 2016 will be his last as a full-time driver. Clint Bowyer, currently driving for HScott Motorsports, will replace Stewart in the No. 14 in 2017. Are you ready for NASCAR? 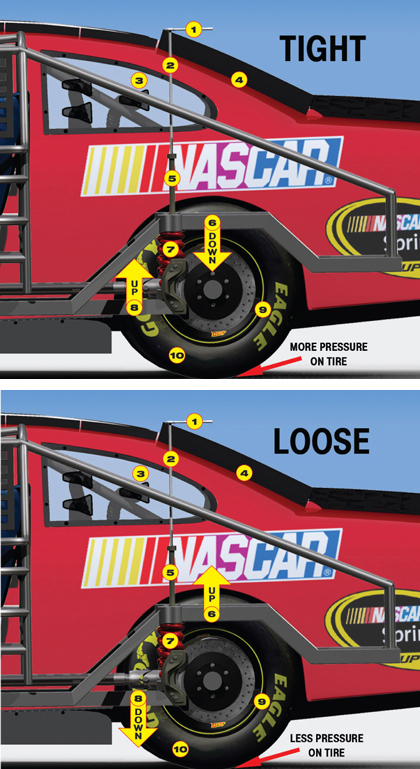 Have you ever wondered what they mean by a #nascar being tight vs loose? While it is not simple; here is the simple explanation. TIGHT: Also known as understeer. This occurs when the front wheels lose traction before the rear wheels. It causes the stock car to have trouble steering sharply and smoothly through the turns as the front end pushes towards the wall.